Recurring themes are a thing in my life. I doubt it’s some cosmic thing- it’s likely that my mind and heart come to a ready place where I can see all the things that just exist around always, but suddenly a message is illuminated for me and I find it much more significant at that point in time. It sort of doesn’t matter why, I like them. I love seeking and finding the strange metaphors and parallels and consistencies that exist in the universe. They help me make sense of my journey. I like to write about them when they do happen. Lately they’ve been surrounding my long-standing desire to simplify, but more specifically, to be wild. I want to be a human animal. I see a joyful wildness in my kids, getting soaked and dirty out on the farm and immersing themselves in make believe. This is a feeling that swirls around me constantly. I’m aware of this longing because I get closer to it all the time.. little teasers of what my natural state might have been in a different world. Off the top of my head- the feeling I got when I began homesteading. It was a whole family of experiences and feelings that felt like I was coming slowly back into alignment with my purpose. Actual, physical connection with what sustains me. Soil, air, plants, animals, and me. I am at my best when I feel my roots intertwining with the roots of everything else that lives so I can live. I also felt it with the collection of sensations I had when I had my babies- primal, natural, good, earth-and-spirit bound all at once. It was powerful stuff that I couldn’t have reproduced anywhere else. Conversely, I’ll feel this longing towards wildness because the environment and circumstances are so contrasting and so separate from that goal. Jeff and I frequently find ourselves driving through barren lands, strip-malls, a “concrete paradise”. We’ll have a split second between us where we realize it’s imaginary, it’s dead, it’s not in service to the living… not really, anyway. I feel the barriers between that primal “me” and the version of me that is allowed to manifest here. I guess there have been a cluster of events and reminders of this deep longing in me. Messages from the universe? 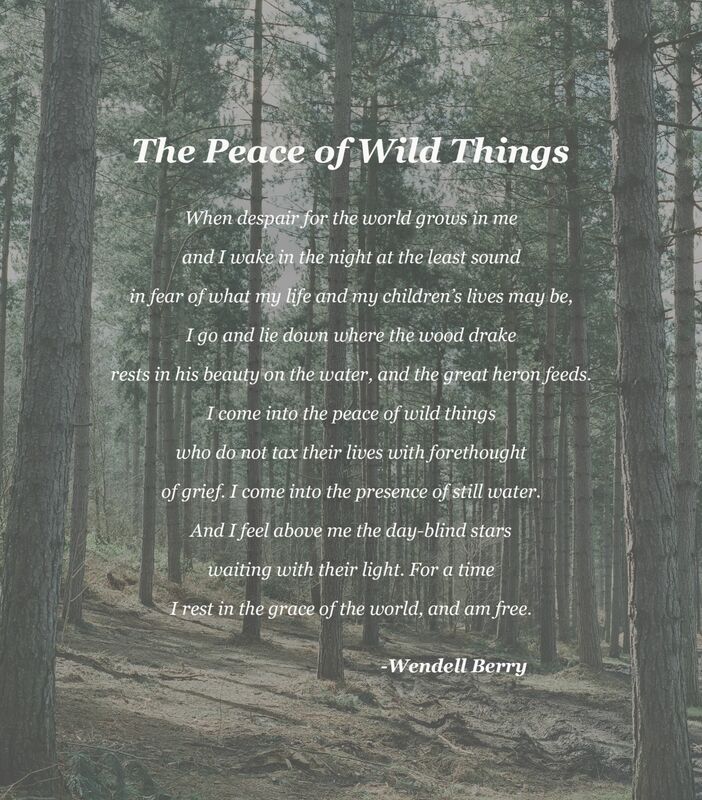 Wendell Berry got mentioned several times in the course of a week, in ways that made me swoon and stop to think. I took the hint and decided to familiarize myself with his work, and upon a good friend’s recommendation I’ve started with a novel called Hannah Coulter. Its simple story is eerily perfect for me right now (having replaced a couple of other books that just weren’t delivering for me), and I’m reading it and easily tapping into that familiar longing. I’ll try to write more about what I thought of it when I’m finished. The whole thing is lovely, but those first 5 lines… they feel like a deep truth to me. There are precious people in my life (myself included) that I’ve longed to deliver that message to in a way that would have them believe it. Anyway, this lovely musician reads this heart poem and then goes into this song, and I just felt elevated and pulled in by this message. Could working to realize my own wildness be part of my mission here? My 7 year old, wild and lovely in her own way. Anyway, I’m ruminating on all of this. Between the house build and work and the hectic pace we have set, I’m leaning into some of the things that ground me and put me in touch with some of that peace. Making good slow food for my family, foraging and observing, reading to the kids and playing with them (and with Jeff, for that matter), doing yoga. These are the things that ground me and keep my perspective in check. Autumn olive berries near the house site. They are not quite ripe but we’ve been eating them happily anyway. Beautiful things are beginning to grow amid the disturbance at the house site. I am eager to see it grow and mature from this point forward. I really feel so grateful, and I haven’t had any feelings of resistance about really entering my 30s. I’ve found some gray hairs, I’m seeing youth through new lenses, and I assume my perspective and body and all of that will continue to mature. I have been a little alarmed to hear all the comments about backing away from that reality (lots of “oh, you’re just 29 again!” or “oh you still look young”, that kind of thing), but I feel really fine about it. I figure, if my 85 year old self could hear me whine about being “old” when I’m only 31 and in good health and active and living the life I’m living now with all the blessings it holds, I would want to kick myself! And my whiny present-day-self would deserve the kick from my imaginary-future-self. Resisting our aging seems to me to dishonor all the gifts that come with that privilege. I am alive, I am wiser, I am changing, I am growing, I am me- the same me that was a baby once, a bright fearless crazy teenager, a young mother, a grown woman. I am the sum of all my parts (to quote my wise dad). I had a lot of those thoughts about age & aging when I turned 40 last winter. You’re so wise, my young friend. I hope you had a great birthday. Did you get my text? I love this post. Thanks for sharing. I too love the wild. As for that honeymoon…later your little ones will grow older and will move on…many honeymoons await and they are so sweet. That was amazing. Thank you for your love and friendship, your wisdom and grace, your beauty and sharing.